Normally, I would say to not let the molding process intimidate you because usually you can repeat it a few times, if you do not get it right on the first try. However, SnoreMeds can only be molded two times total, so you want to really try to get a good fit on your first try. It is hard to say though if the device really can’t be molded more times or if the company is just trying to get you to buy the economy box, so you have extras, if you mess up. Make sure to check out our SnoreMeds review to learn more about the mouthpiece. 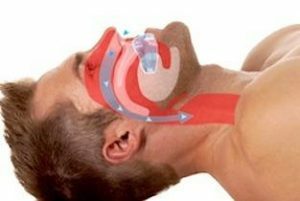 Before tackling the first step take a few minutes to become familiar with your anti-snoring device. Considering you only have two chances, you do not want to waste your first one on putting the device in your mouth upside-down. Practice putting it in your mouth while you extend your lower jaw forward. This will need to be done before you bite down. You will also need to insert the included spatula in the air hole. This eliminates the need for a spatula or pair of tongs. Plus, it prevents to the air holes from collapsing when the water softens the material. Bring a pot of water to a boil and pour it into the bowl. Hold the spatula and submerge the device for 15 to 18 seconds. It is very important that you pay attention to this step. Some devices allow you to submerge in hot water for as long as a minute, but this one is 18 seconds at the most. Remove from the bowl and shake away excess water. After it cools a few seconds place the device in your mouth. You should be still holding it by its spatula. As you insert it, remember to extend your lower jaw forward 3 to 5 millimeters. Bite down firmly. Press against the inside with your tongue, and use your fingers to push on the outside of your lips and cheeks to get a good fit. Once you are sure your impression has been left in the material, remove it and soak it in ice water. This will speed up the hardening process. When the mouthpiece has cooled, check the fit. If it is not right, you can redo it, if you are not positive if it is right; leave it as is to try for the night. Then, you will be able to better determine if you really need to redo it again. 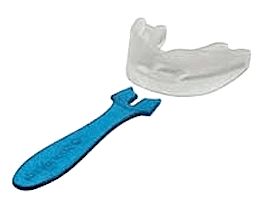 Many other snoring mouthpieces will be shaped in a similar manner.